Andrey Rublyov (Andrei Rublev) Russian painter and monk. All his known works and those attributed to him were undertaken in Moscow and in towns and monasteries near by; he may therefore be described as a representative of the Moscow school of painting, but his work had a profound influence on the development of Russian art in general. There is little secure knowledge of his life or works. In 1405 he worked as assistant to Theophanes the Greek in the Cathedral of the Annunciation in the Kremlin in Moscow, but it has not been possible to distinguish his share there or in the Cathedral of the Dormition at Vladimir where he is also said to have painted murals. 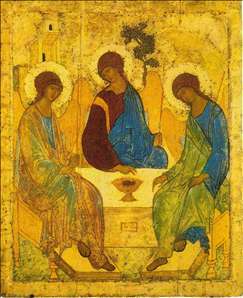 The work that stands at the centre of his oeuvre is the celebrated icon of the Old Testament Trinity (that is the three angels appeared to Abraham) in the Tretyakov Gallery, Moscow. In its gentle lyrical beauty this marks a move away from the hieratic Byzantine tradition, and other icons in similar style have been attributed to Rublyov. See more details about "Trinity"